CEDAR CITY — Green infrastructure is a cost-effective and resilient way to manage weather impact and provides many environmental, social and economic benefits. Southern Utah University is using green infrastructure as a resource for the Cedar City community and a place for students to conduct research. Found on the roof of the L.S. and Aline W. Skaggs Center for Health and Molecular Sciences, the green roof is covered with a thin layer of material in which native plants grow. The green roof helps insulate the building from the extreme cold and hot temperatures of Cedar City and soaks up rain to prevent flooding. Jacqualine Grant is an associate professor of biology at SUU and the director of the Garth and Jerri Frehner Museum of Natural History. As a conservation biologist, her work focuses on green infrastructure and organismal biology related to insects, mammals and amphibians. “A green roof is covered with plants and a special soil-like matrix in which tough plants can grow,” Grant said in a news release issued by SUU. 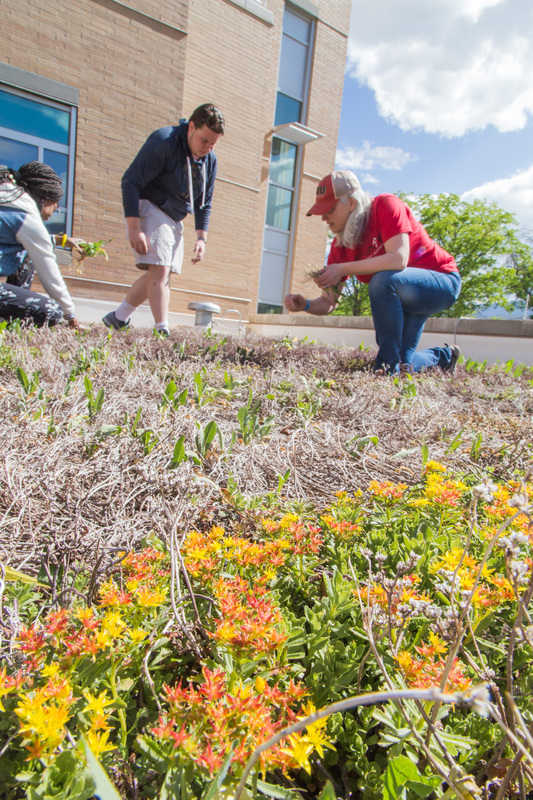 “The green roof at SUU was created in 2010 as part of the national Leadership in Energy and Environmental Design certification process that gives us national recognition for sustainability on campus. 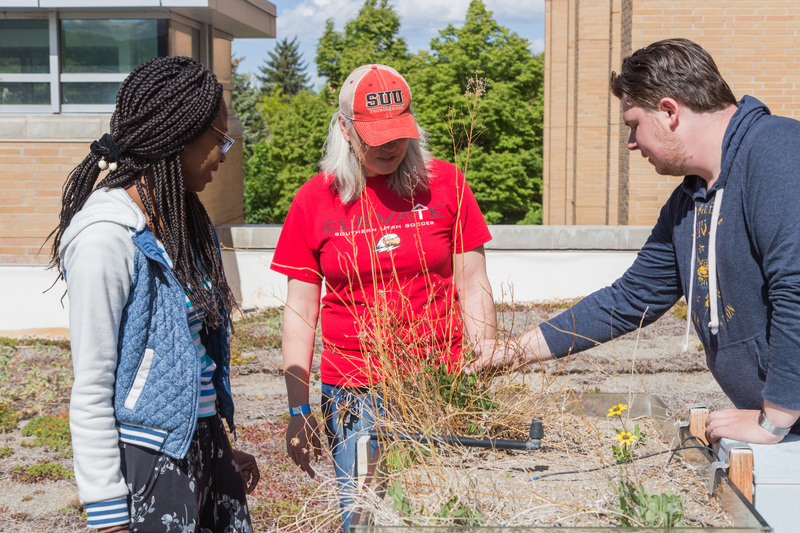 The first years of SUU’s research, which was supported by the National Science Foundation, showed that very few pollinators were attracted to the nonnative plants on the roof, so in 2016 native plants were added. SUU students gain research experience by studying the green roof and have built a special piece of equipment called a lysimeter, which measures how much water is used on the green roof. Their research will help determine if, in addition to insulating the building, green roofs can also be used to grow food. Providing urban biodiversity, reducing noise and air pollution and increasing the lifetime of the roof, a green roof offers many environmental benefits and is cost-effective in dense areas where stormwater management costs are high and energy conservation is a priority. Green infrastructure may seem to have an urban focus and feel out of reach to the average homeowner, but by repurposing the flow of stormwater, homeowners can help reduce the flow of water into storm drains and save on water bills. Build a green roof on a dog house or backyard shade shelter. Remember that green roofs are heavy so your construction needs extra support to hold the weight of plants, matrix and water. For instructions, visit the Pet Project blog. Map where the water flows in your yard after a rainstorm. Is the water flowing away from the yard and down the street? You might consider a landscape design that encompasses rainwater harvesting to nourish your plants. Check your local regulations and read Brad Lancaster’s book about harvesting rainwater. Ask your USU Extension agent to measure the effectiveness of your irrigation system. They can help you determine how much to water and possibly recommend some low-water native grasses for the lawn. Learn more about green infrastructure at Environmental Protection Agency’s website. Interesting thought but during the hot dry summers here wouldn’t that vegetation become a fire hazard like all the other native plants?